Who knew that sun-touched simplicity could be so luxurious? Whitewashed cubist Mediterranean architecture. White walls. Cool white tile floors. Snowy white bed linens. White furniture and chairs draped in white fabric. The white-on-white effect at Casa Angelina is the opposite of stark; it's more that of a gloriously, luxuriously clean slate against which the perfect vacation can unfold at leisure, the ideal backdrop for the vivid views of green-cloaked terraced mountains, the glimmering teal waters of the Gulf of Salerno, and the sun-bathed Isle of Capri visible from every window and terrace. 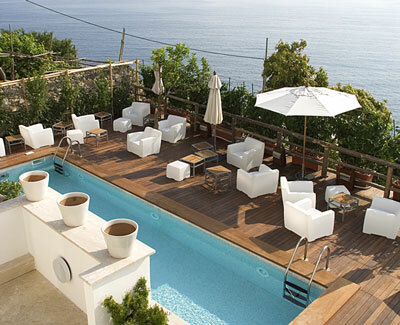 Refined, relaxed indulgence is the sort of lifestyle Casa Angelina has in mind. Fresh flowers and amusing Murano glass sculptures add sparks of color to the pale surroundings. A panoramic lift takes guests down to the private beach nestled in a cove below the hotel, or up to the fourth-floor restaurant, Un Piano nel Cielo. Lingering over meals in the appreciative Italian fashion is a double pleasure here, thanks both to tempting concoctions such as pumpkin flowers stuffed with cheese, zucchini, and olives or citrus risotto with king prawns, and to the mouthwatering view diners drink in with every meal. Afterward, aficionados can retire to the cigar room. In addition to the outdoor pool, there's a huge indoor Jacuzzi® pool under a "sky" of optical-light stars, overlooked by the techno-gym outfitted with state-of-the-art equipment. And when you tire of soaking up the sun on your balcony or terrace (nearly every room has one), the hotel's Sea Gem boats await, ready to zip you off to Positano or Capri, Naples or Sorrento to explore.